Acorn offers a wide variety of floor locks. For additional information on any specialty product, or if you do not see the specialty product you are looking for, contact Acorn™ and a sales representative will assist you. Click here to download a PDF with our complete selection of Floor Locks. ﻿﻿• Easy to engage and disengage – even with safety shoes. • Extra heavy duty construction. • Safely secures the truck in position while loading or unloading. • Instantly released by slight downward pressure. • Large diameter, non-skid rubber pad ensures firm grip to uneven ground surfaces. • Operating force does not vary with load. 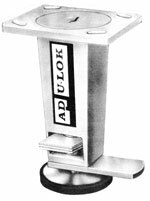 ﻿This one of a kind floor lock includes an adjustable height foot pad that will work on carts with different caster heights. 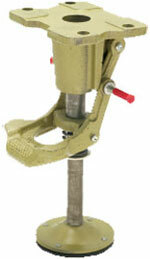 The adjustable height feature provides uniform locking and safety unlocking force for better ergonomic operation. This feature also keeps the floor lock working properly as spring and pads wear over time. Height is adjustable by turning the bottom pad. This unit has a bright zinc plated finish with heavy-duty cast steel construction. The bottom pad includes suction-cups for extra grip. ﻿Extended Height: 5-1/2" - 8-1/2"
Retracted Height: 4-1/2" - 7-1/2"
Used with Caster Size: 4" - 6"
﻿Extended Height: 8-1/4" - 10-3/4"
Retracted Height: 6-1/4" - 9"
Used with Caster Size: 8" - 10"
• Double pedal design provides greater operator safety. • Large steel disc has non-marking rubber pad for non-slip floor contact. • Simply press down on the larger pedal to set positive locking force of 90 to 120 lbs. against the floor. • Press down on the release pedal and spring quickly returns lock to non-operating position. • Both pedals are out in front for safety and ease of operation. ﻿This lock lets you immobilize equipment in any desired location, but does not interfere with its movement when not in use. 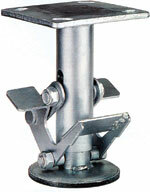 Platform trucks, fixture dollies or other castered items can be locked in place by a simple press of the foot. Locking action is created when a large, round friction face of nearly 10 sq. inches in area is pressed against the floor with the force of 70 to 100 lbs. This position lock does not lift equipment. 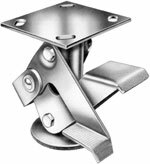 ﻿﻿A position lock lets you immobilize equipment in any desired location, but does not interfere with its movement when not in use. 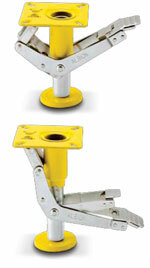 Platform trucks, fixture dollies or other castered items can be locked in place by simple foot pressure. Locking action is created when a large, round friction face of nearly 10 sq. inches in area is pressed against the floor with the force of 70 to 100 lbs. The position lock does not lift the equipment as the spring-allowed applied force is not as heavy as the weight of the castered item. ﻿﻿These Floor Locks represent an easy, low cost method of preventing castered equipment from accidentally rolling away from its desired position. Depressing the foot pedal on one side forces the spring-loaded Neoprene brake shoe against the floor under compression. 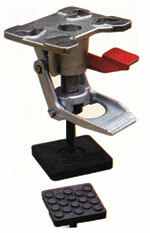 Stepping on the opposite pedal retracts the mechanism. ﻿﻿﻿Efficient self adjusting floor lock for positioning trucks, stands and work benches for safer loading, unloading and work convenience. In most applications provides greater floor clearance than other type floor locks.